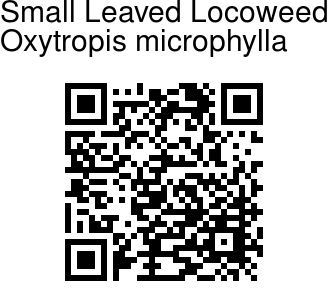 Small Leaved Locoweed is a perennial herb with thick and woody root. Aerial stem is absent. Leaves are pinnate, and leaf bases are covered with white or yellowish woolly hairs. Leaves are up to 18 cm long, with stalks up to 5.5 cm long, glandular, hairy. Leaflets are alternate, opposite, mostly whorled, nearly stalkless, linear-oblong, up to 8 mm long, about 2-4 mm broad, gland dotted and hairy. Flowers are borne in a raceme held atop a long stalk. Bracts are 4-5 mm long, gland dotted and hairy. Flower stalks are 1-1.5 mm. Sepal structure is 1-1.1 cm long, hairy and covered with brown glandular swellings, teeth 2-2.5 mm. Flowers are pink-purple. Petals are 1.9-2.1 cm. Fruit is 1.5-2.5 cm long, 4.5 mm broad, with a pointed tip, smooth with glandular swellings, almost completely bilocular, 20-30-seeded. 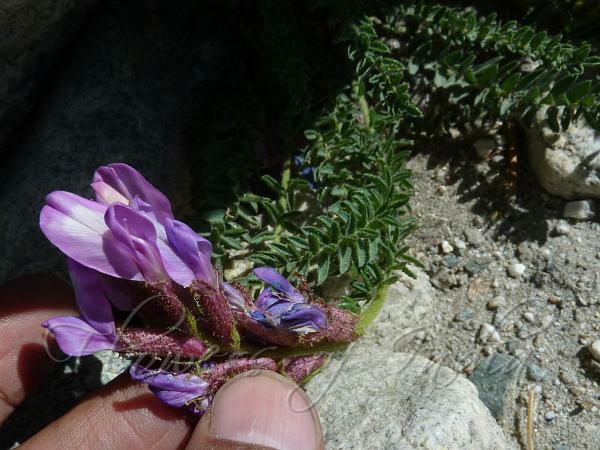 Small Leaved Locoweed is found in the Himalayas, from Pakistan to C. Nepal, at altitudes of 2700-3600 m. Flowering: May-August.